Earn international HR acclaim with the Professional in Human Resources – International™ (PHRi™) from HR Certification Institute® (HRCI®). 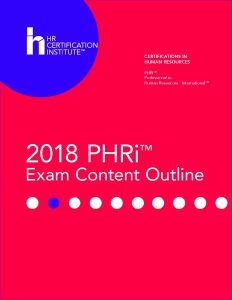 The PHRi (formerly the Human Resources Business Professional™ or HRBP™), for internationally based practitioners, validates professional-level competency, knowledge and skills to help to propel your HR career forward. With the PHRi, you demonstrate mastery of generally accepted technical and operational HR principles independent of geographic region. Actions needed to make sure an organization has employees with the right skills in the right positions at the right time. Activities that support employees and managers by responding to requests for information and gathering and storing information in a manner that ensures integrity and accurate retrieval. Processes that support effective talent management, employee engagement and development. Total reward systems that support recruitment, retention, and recognition of employees and improve organizational results. Policies and practices that ensure workplace safety, legal compliance and employee satisfaction.